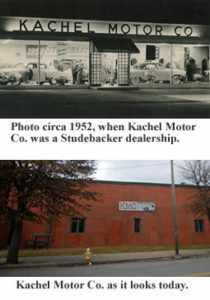 The first Kachel Motor Company began in 1952 as a Studebaker Dealership. It was founded by William Harrison Kachel Jr. who had a strong love for automobiles. He inherited this love from his father William Harrison Kachel Sr. who in the late 1930’s owned an automobile repair shop. The love of automobiles has been carried through the generations to the present manager, Timothy J. Kachel, of Kachel Motor Company who is the Great Grandson of William Jr. The passion now is no longer Studebakers, but German and Italian High Performance automobiles. We are in the business of selling, maintaining and custom fabricating to satisfy the needs for the “Love of Your Automobile”. My husband and I have serviced our track-prepped Caymans here for the past few years. We are always impressed with their knowledge, level of service, and respect for us as customers. They get it right the first time! KMC….expertise at its finest. The guys at KMC are true masters in the craft of automotive engineering and salesmanship. Tim and David are true wizards when it comes to anything mechanical while Jason is knowledgable beyond belief when it comes to the car you want and locating it as well. I advise all my friends to take their cars to KMC from simple service to track builds and anything in between. KMC 5 stars! TIm and his team have an exceptional attention to detail and their quality is unsurpassed. I service multiple cars at KMC (one high-end and one not so high-end) and I can rely on their professionalism, honesty and timeliness. They are a top notch shop for people who track their cars and we entrust our safety to KMC. If you desire a customer focused repair shop, KMC is the place to go and stay with. I’m a big fan. The group has worked on a succession of my Porsches, road and track, carrying out regular maintenance and small-to-major modifications for the track. A gorgeous crash cage that they engineered totally protected me, leaving me without a scratch, in a major track incident (of my own doing). Their work is excellent, their technical expertise is deep, business dealings are very fair, and, very importantly, communication is open and timely. As you know I own a business also and I’d just like to give you and your staff kudu’s for the professional service I received when purchasing my Boxster. From the day you and I talked and you said you had what I had been hunting for ( year, color, mileage, etc. ) I have been happy with your service. You have put a smile on this 60 year olds face you just can’t wipe off as I drive her with the top down !! I will and have recommend you folks whenever the opportunity presents itself.